If there was anything to foretell our trip, it was our first day leaving Chicago. Huge storms were coming and we had to divert our traditional route of taking I-90 through Wisconsin west to something else. We instead had to start out our trip by heading into Iowa to avoid the storm and then swinging north into South Dakota near Waterloo. It was on and off rain the whole day. Day 2 had has trekking across the rest of South Dakota. From the very moment that we crossed the border there were billboards for Wall Drug, hundreds of miles away. I couldn't believe how many billboards we saw on the ride. I could only wonder how Wall could afford all of these and also why all of these farmers wanted them on their land. If you haven't ridden through South Dakota, the vast majority of it looks pretty much like western Illinois. Corn for as far as the eye can see. Eventually it changes to sun flowers. It wasn't until we crossed the Missouri River that we saw an almost immediate change in the landscape. Farmland opened up to rolling grasslands. In the afternoon we hit up the Badlands, drove through that park and got some great photos. 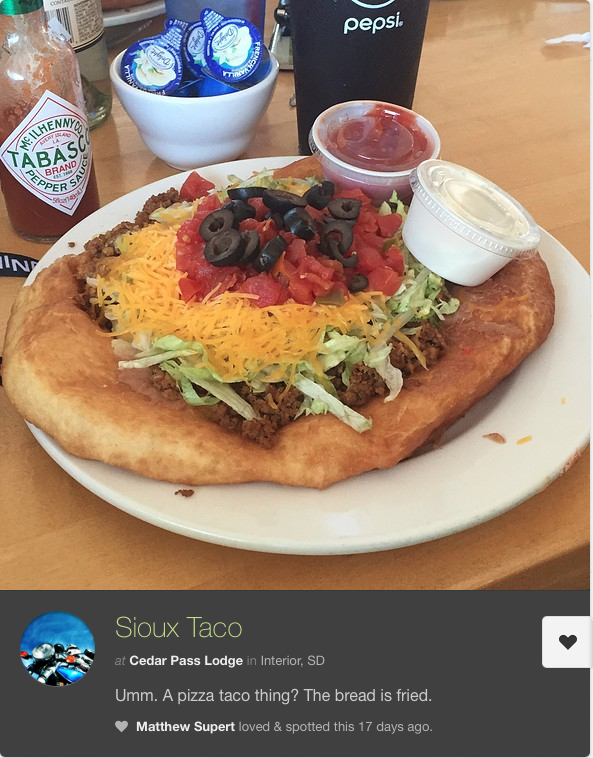 We had lunch at the Cedar Pass Lodge located inside the park and I had a Sioux Taco, which is basically a Taco Salad placed on top of Sioux bread, which is a sort of sweet fried bread. I got my National Park Service stamp for the park at the visitor center and we were once again on our way heading towards Wall Drug. It is a tourist trap to be sure, but we wanted our free ice water. That ice water was surprisingly hard to find. We only quickly walked through the stores. The day was getting long and hot so it was time to head out once again. Keystone was our stop for the evening. We checked into our hotel, had a disappointing buffet dinner and then hit up Mt. Rushmore to see the evening lighting of the mountain. Now the evening lighting ceremony was really fantastic. After lighting up the monument at sunset the NPS then brought all of the veterans or active service members up onto the stage to assist with taking down the flag for the evening. We then all sang the National Anthem. Very "Americana". After briefly meeting back at Mt. Rushmore the next morning to get some morning shots of the monument we were off on the road to get some of our best riding of the trip in. First up was Iron Mountain Road. This road is most notably known as the one that has the tunnels cut into the mountain where you can see Mt. Rushmore through the tunnel. We were taking it down the mountain so we didn't get that view, but It was a fantastically quiet and narrow road surrounded by pine forests on all sides. It is also known for some of its fantastic corkscrew curves, with wooden bridges. Our next stop was to Custer State Park which featured another beautiful road called the Wildlife Road. There we ran into a pack of feral Donkey or Burros which roam in the park. They were in short, adorable. They just casually walked down the road right towards us with no cares in the world. The foals were fuzzy and very playful. Later along the same road we came across the pack of Bison in the park. Getting past them proved to be difficult since the herd was in the middle of the road. It took us almost an hour to get past the herd as they moved through the road. Our last major ride for the day was to hit up Needles Highway. This was another scenic ride through the mountains, this time featuring more high sierra types of landscapes opposed to the pine forests of the Iron Mountain Road. On the ride up there were huge rock formations jutting out of the ground on either side of the road. The peak of the ride was at Needles Pass where the rock outcroppings cross the road in a sort of open topped tunnel. It was very pretty. Leaving the pass we had a long trek ahead of us heading south. As we moved into the open grasslands on the road it became apparent how remote this part of the country truly was. We didn't see any towns for hours and the temperature quickly grew to around 102 degrees. It got really hot and and I began thinking to myself that we would be in serious trouble if any of us had mechanical problems out there. We stopped at a gas station in the middle of nowhere and ran into a couple of other bikers heading north up towards Needles Highway and Custer State Park. There were two BMW 1200GS riders loaded to the brim and a very hipster looking guy riding a Ducati Diavel. He seemed nice enough. We also passed a bicyclist on the highway as we rolled out and I couldn't help but think to myself that the guy was sort of crazy. I hope he had enough water. The long ride continued through more high temps and eventually high winds. The sun set and we rode a mountain road in the dark before finally getting into Estes Park late that night around 9:00 PM. It was a long day, but a great day of riding. Day four was one of our lighter days of riding. We had ridden pretty hard the previous three days, pulling close to 1500 miles. Our ride through Rocky Mountain National Park was perhaps my favorite single ride of the whole trip. 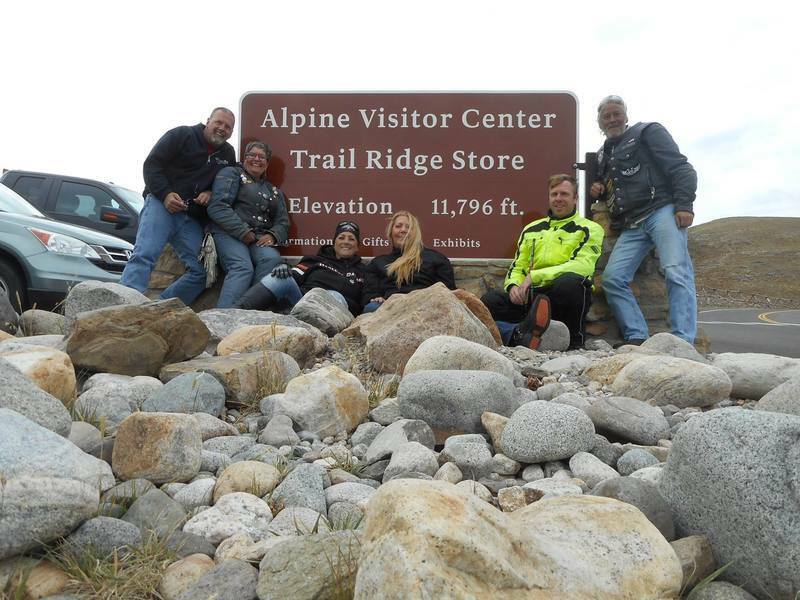 We rode up to around 12,000 feet and the views up on the Trail Ridge Road were spectacular. This road rivals the Going to the Sun Road in my opinion, which is routinely called one of the most scenic roads in America. We finished up the day grilling that evening. So, day five was the most miserable day of the trip. In fact, it was the most miserable ride I have ever had on the bike. I don't have many photos from this day except for the one above. I was soaked to the bone and I was not smiling. Before I get into that though I am going to throw up a quick photo of my travel journal. Over the past year I picked up a Traveler's Notebook, which is basically just a leather-bound cover with inserts. Any notebook would do. 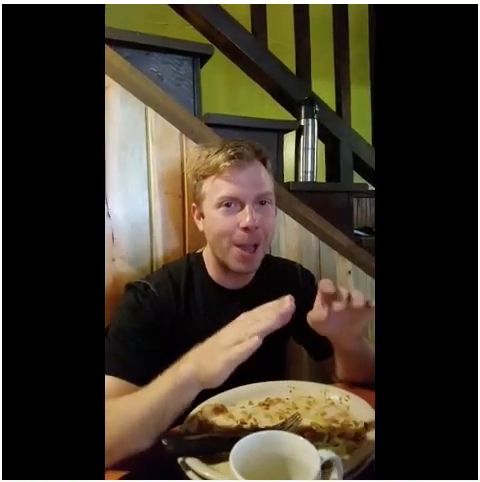 But I wanted to begin documenting my vacations, motorcycle rides, etc. If you didn't know, every national park and almost all state parks, museums and other heritage sites have stamps. When you go to these you can visit the information desk and almost always get a stamp for your notebook. The National Park Service has a special passport itself for all of its parks and monuments. I really enjoyed keeping track of my adventures on this ride with it and I would highly suggest anyone out there who likes to travel to pick up a similar type of notebook or journal. It really adds to the travel experience. 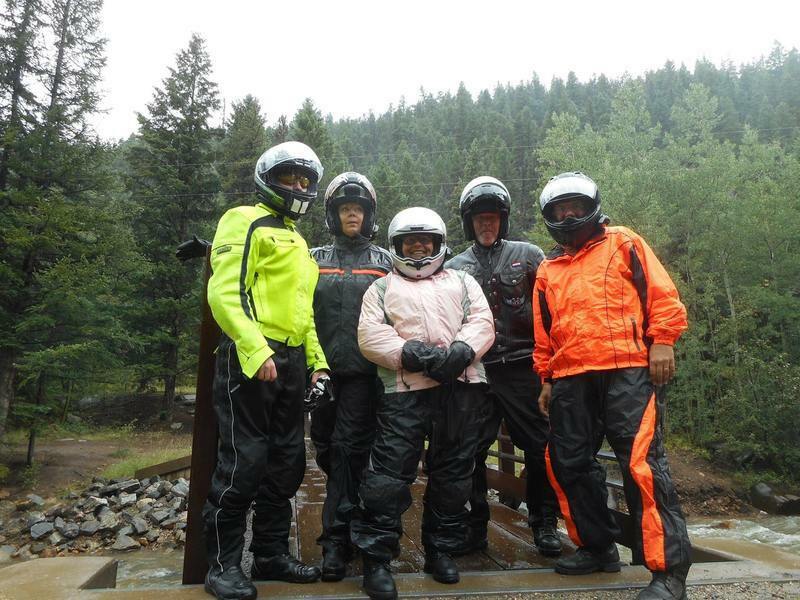 So we planned on riding to Guanella Pass, outside of Colorado. This was supposed to be a short riding day. The weather in the morning was stating that there was a 15-20% chance of rain, but we thought we would miss most of it as we headed west. Well, as we got on the road the rain began to fall. It started out as a drizzle and then it slowly contained to get worse and worse. By the time we made our first stop it was raining lightly, but steadily and the temperature had dropped to the mid-fifties. It was cold, but not unbearable. At the time I was part of the group that advocated for pushing on with the ride. I regretted that choice for the next few hours. As soon as we got back onto the road the weather continued to worsen. The temperature continued to drop and the rain only grew heavier. By the time we got to the pass it was close to forty degrees with a steady rain. What should have only taken us a a few hours quickly grew into an all day affair as we had to traverse the mountain pass road at about 15 mph. Despite having waterproof gear, water penetrated into all of my clothes. My gloves, my boots, my pants. It was just too much sustained rain. It was beyond miserable. We finally made it to the other side of the mountain and stopped in a town called Georgetown to lunch at a Mexican restaurant called Lucha. It was a great lunch stop and coffee and hot tea was ordered in abundance. Georgetown was also a beautiful little tourist town tucked away in the mountains. We finished off the day with a cold ride back to Denver. 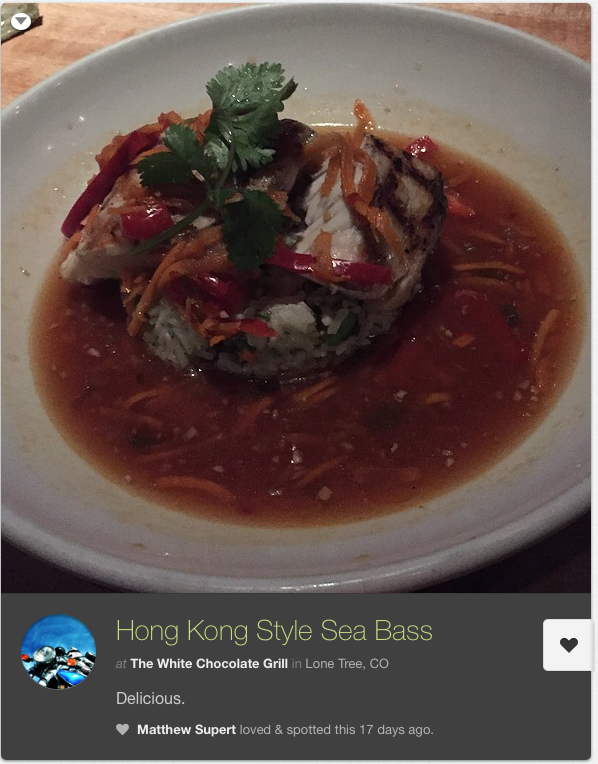 I took the longest hot shower of my life before we had an extra special dinner at the White Chocolate Grill in Denver. A much needed Manhattan was ordered and I had a delicious fish dish called Hong Kong Style Sea Bass. We also sampled just about every dessert on the menu. So for day six we had a lot planned. We wanted to hit up the Royal Gorge, the Air Force Academy, the Garden of the Gods and if time allowed, but probably wouldn't, Pikes Peak. Royal Gorge was our first stop. 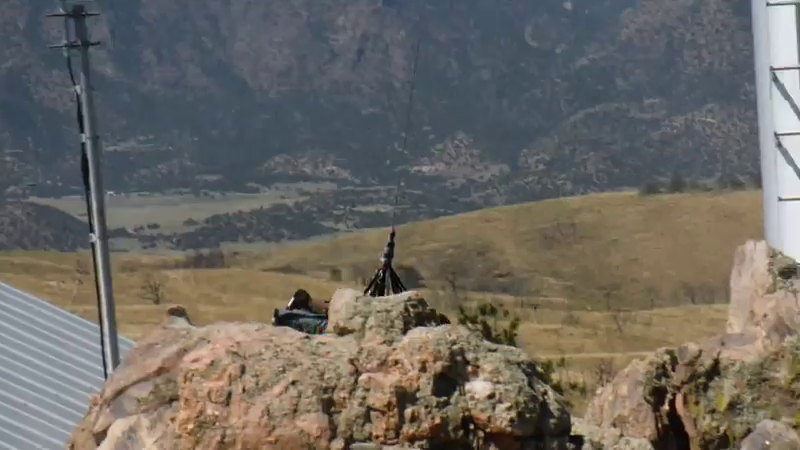 It is a privately owned gorge way southwest of Denver. It was a bit touristy, but there was some fund to be had. They had a gondola and a bridge which spanned the gorge, which made for some great sights. Our next stop was the Garden of the Gods. We had a late lunch and then drop through the park. I would love to come back here at some point to hike and bike through the park. It was gorgeous. Unfortunately the rest of our day was cut short at this point. A huge storm rolled up over the mountains and came down upon us. Pike's Peak was lost in the storm clouds. The storm started out a dust storm and then quickly opened up to a torrential downpour which lasted for about thirty minutes. We found some shelter in a Harley-Davidson and were able to slip out between some of the storm with only light rain on the way back to Denver. Well the bulk of our trip was done. It was time for the long trek back across the boring plain states and back to home. The ride back from vacation or any trip usually is the most tedious. We of course had to battle with rain once again. Over 500 miles completed that day and we ended up in Council Bluffs for the night. We also happened to have one of our best meals. We stopped at the Salt Dog for dinner which was near the truck stop off of I-80. It was exactly the type of place you would find in these parts and I was surprised we hadn't eaten at more places like this. It was my next favorite meal aside from the White Chocolate Grill. Country music was playing. Sports were on the TV's and guys were playing pool off to the side. 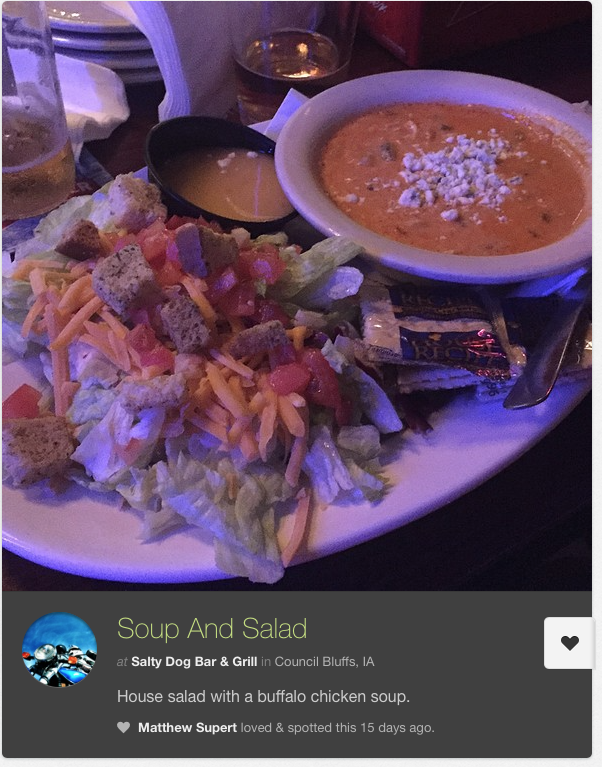 I had a remarkably good buffalo chicken soup with some Angry Orchard Cider. Here it was the final blast home. Nothing special to write about for Iowa and Illinois. Our goal was to blast through the state and get home as quick as we could. I arrived home on Saturday around 2:00, which was great. I was beat and my bike was absolutely filthy. It was a great trip though. I got a ton of new stickers for the panniers. Close to 3,000 total miles.